Brand New to Food Angles! These innovative pastry cases are perfect for displaying your canapés in a different and creative way. In 3 flavours, the Mussel Shells from Pidy are a great new addition to our range which offer elegance and style to all catering needs. Impress your guests at catering events and functions. 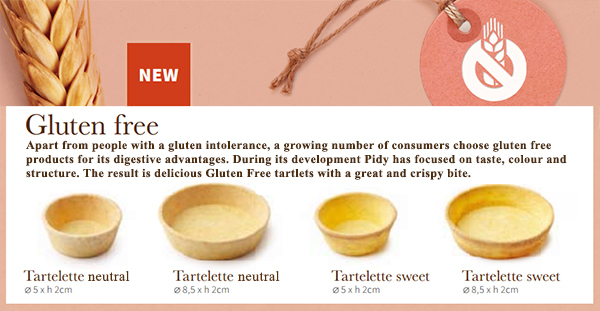 We have increased our selection of Pidy Trendy Shell Pastry Cases with new shapes and sizes for you to try, such as the 7cm Neutral Triangular Trendy Shell and new 7cm Round Chocolate Trendy Shells. These very attractive Trendy Tartlets are perfect for finger-food style buffets, who could resist the melt-in-the-mouth shortcrust pastry when filled with your own tasty creations. Pidy Gluten Free “ready to fill” range were awarded as one of the winners at the 2016 Casual Dining Show! Pidy Say: "We are very proud of this award as it rightly recognises the excellent quality this range has to the “real thing” and also endorses Pidy’s unequivocal reputation of being first to market with cutting edge innovation in our sector!" Apart from people with a gluten intolerance, a growing number of consumers choose gluten free products for its digestive advantages. During its development Pidy has focused on taste, colour and structure. The result is delicious Gluten Free tartlets with a great and crispy bite. Confiletas is the leading Spanish manufacturer of sweet and savoury food bases. Ready to fill and easy to use for all types of occasions. The most perfect bases for your tiny creations. Take a look at our wide range in stock today. Take a look at our NEW range of wines and spirits that we have selected with the customer in mind. A fantastic offering of wholesale alcoholic products for events, caterers and restaurant owners. No Minimum Order & National Delivery applies. We have introduced a new selection of Pidy's Mini Cones and Horns just in time for the summer. On the sweet side we are now stocking 7cm Sweet Chocolate Coated Cones which are great with all sweet fillings, especially strawberries & ice cream. We also have the 7cm Neutral Horn Cornets which are brilliantly refreshing when filled with a summer fruit salad and cream. If you would prefer something a little on the savoury side, why not try our new 7cm Seasame Seed Cones which has a crisp wafer flavour. Now at Food Angles! Check out securely and pay for your order using PayPal. You only need your email address and password to make a payment. The simple, quick and safe way to pay online.